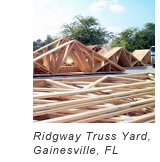 Ridgway Roof Truss has been producing roof trusses since 1959. We have built almost every design including round trusses. No project is too difficult, too large, or too far for us to help you. We can produce trusses up to 85' long. For your project we will custom design a roof system with trusses to suit your needs. We are willing to verify slabs and do on site visits.